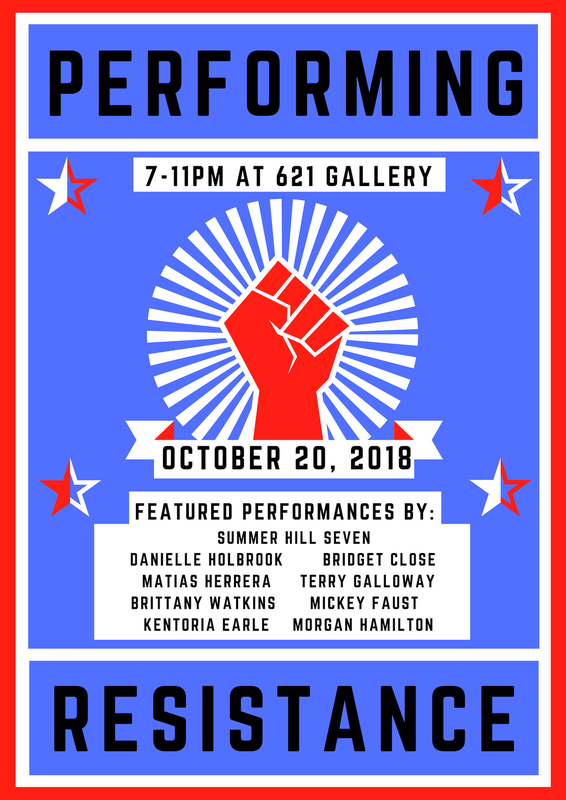 You’re invited to attend Performing Resistance at 621 Gallery this Saturday, October 20th from 7-11pm. This event will feature performance art, music, poetry, dance, political song, and spoken word centering around the theme of our current exhibition The Art of Resistance. The Art of Resistance “is to offer an artistic alternative to the dark argumentative quagmire of the current political situation, and allow, rather, the transcendent power of imagery, symbolism, and metaphor to speak to the hearts of the citizenry and its culture.” In the wake of our current political climate, gun violence, the environment, the #metoo movement, election fraud, immigration and women’s rights are some of the most prominent themes expressed in these works. Feature performances by: Summer Hill Seven, Kieron Sargent, Matias Herrera, Terry Galloway, Brittany Watkins, Mickey Faust, Kentoria Earle, Morgan Hamilton, Danielle Holbrook, and Bridget Close.